One of the things I did with fair frequency in my youth was mountain biking. If you're not familiar with it, it's basically biking in the woods, sometimes at high speed and sometimes at a crawling pace during the more arduous hill climbing. There is something about the mix of speed, woods, rock, danger and adventure that makes it a great draw for me. 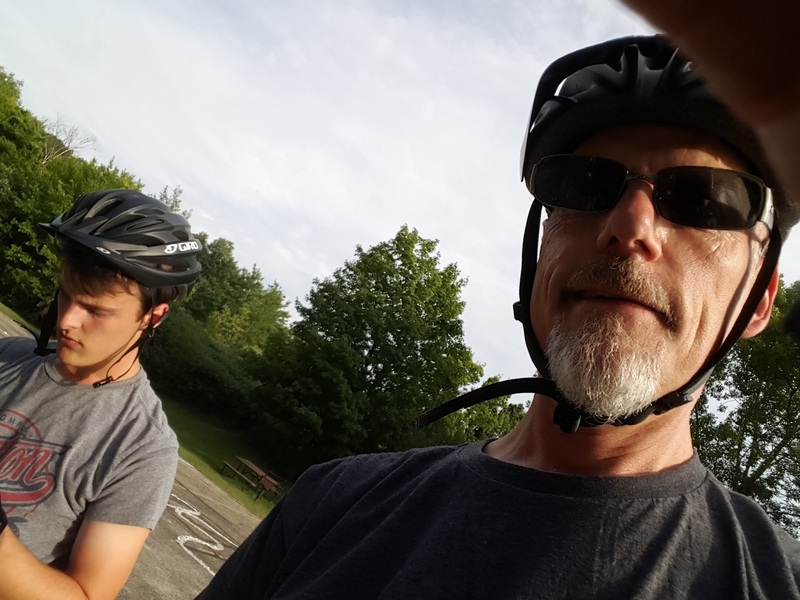 Last summer I took Ben out to the trails at Minooka Park here in Waukesha. 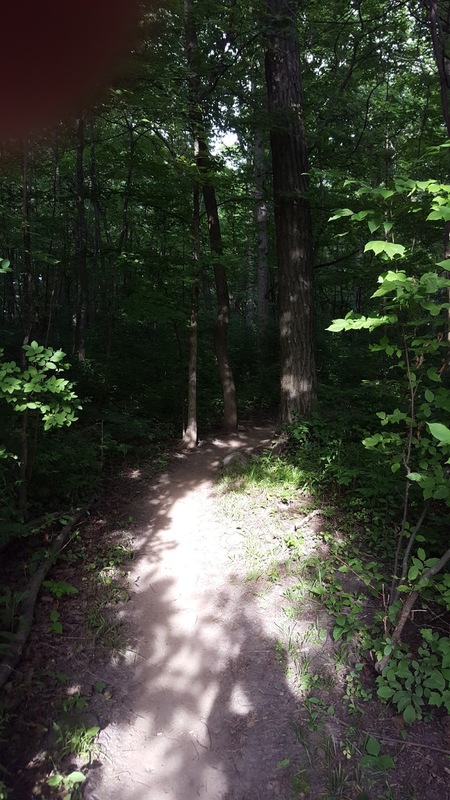 The trail system out there was recently developed and provides a fairly technical ride as well as being a GREAT getaway right in the middle of the city. Ben seemed to really like it last year despite one near accident where he took a hit to the shoulder. He came out of the incident laughing though, which is what Mountain Biking does. It makes your adrenaline rush and gets you so psyched that even the falls are sometimes fun. Well, we've been talking about getting out for a few weeks now, and finally did today. I was going to go out on my usual flat trail (Non-Mountain Bike) ride of 10 miles, but when I asked Ben if he wanted to go mountain biking, he said sure. It was a break in the monotony of my flat trail riding that was much needed. I let Ben lead the way and we started out with an "easy" loop through the green trail. This trail level is simple enough that even a beginner could probably do okay on it. Trails are a little wider and more forgiving with not as many shoulder-width tree passes. It was a nice 1.5 mile warm up. Then we progressed on to the blue trail. It was a blast! 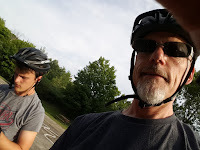 I know that much like downhill skiing, Mountain Biking holds a dangerous allure to me - especially at my age. I am certainly in good enough shape to tackle most of what gets thrown at me. I was barely winded during the 7.5 miles we did today- pretty basic stuff. When I get into trouble, and where the danger lies is in my affection for speed which in many cases is not always on par with my reaction times and reflexes. It's like the kid who loves the water, but isn't a strong swimmer, (also me). It's a toxic mix, an accident waiting to happen. But it can't keep me away, because no one wants a safe, boring, easy life. My brother Tom once said that it's his philosophy that everyone needs a little bit of adventure in their life. (And that doesn't mean the Motel 6 instead of the Holiday Inn.) I think that's part of the appeal of the Boundary Waters Canoe Area. It takes camping to the extreme. Just like Mountain Biking takes biking to the extreme. So, if you know me, I don't come off as a person who likes to live on the edge. I like familiar and routine and I'm a fairly unexcitable guy. But every once in a while I need something closer to the edge of just a little bit risky, or maybe a tad dangerous. Fighting with Wisconsin's biggest species of fish, camping in Minnesota's most rugged terrain or biking on Single-Track trails in Waukesha are all my way of getting it out of me. It ain't scaling Everest, paddling the Amazon and it sure ain't the Olympics, but for this city boy, it'll have to do.